Can Africa leapfrog to low-carbon energy era? Mobile phones allowed Africans to skip the landline stage of development and jump right to the digital age. Today Kenya is the world leader in mobile payments. Are they now leading the way to low-carbon energy era, too? By definition, leapfrogging means “surpass or overtake another to move into a leading or dominant position”. Kenya, like many other African countries, has done leapfrogging in the mobile technology. The country skipped the landline and fax stage of development and jumped directly into the mobile era. Today, Kenya is, quite surprisingly, the world leader in mobile payments. M-Pesa, the text message based money transfer service, transacts already for about half of Kenya’s GDP. There are 100 times as many M-Pesa kiosks in Kenya as cash machines. It has allowed people to pay and transact money safely and easily almost everywhere. The next leapfrogging can happen in the energy sector. The growth of the western wellbeing has been strongly built on fossil fuels. It has lead the western countries to high GDP and welfare levels, and at the same caused serious problems to all over the world in the form of climate change. According to IEA (2015), the CO2 emissions at the U.S. are 16 tonnes per capita in a year, while Kenya has only 0,3 tonnes. The sustainable level has been estimated to be around 1,5 tonnes per person in a year. 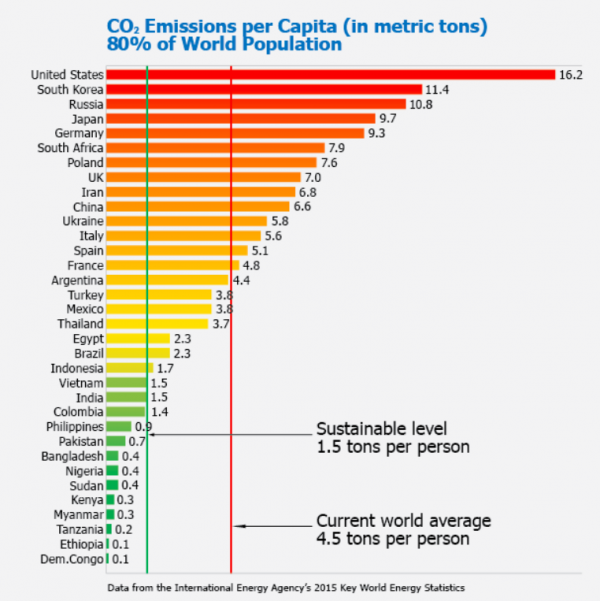 As can be seen in the figure below, the countries with red figures have a lot to do to reduce their emissions. The change is essential and it is expensive, as the whole energy system is based on massive fossil fuel power plants. In Africa, the situation is very different. In Kenya, for instance, almost 90% of the population is not yet connected to the electricity grid. Perhaps they don’t even need to: building pipes and lines to the villages 2000 km away would be really expensive compared to off-grid renewable energy solutions. Furthermore, the local level energy need is low as is the customers’ ability to pay for the energy delivery. At the same time, there is a real hype already going on in the off-grid solar energy systems. 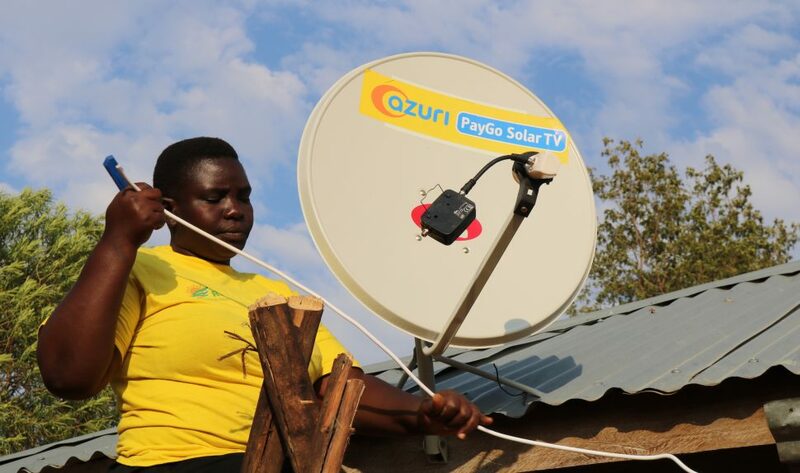 The fast-growing startup M-KOPA, for instance, has connected over 600,000 homes to affordable solar power with 500 new homes being added every day. As the energy infrastructure is still to be built and the off-grid low-carbon solutions are developing fast, there is now a real chance for Kenya to leapfrog the carbon-intensive energy phase and become a leader in the low-carbon energy markets. The question is, of course, how to do that in a poor country where the investment capacity is very limited. Kenya is on a promising track, especially in the electricity production. 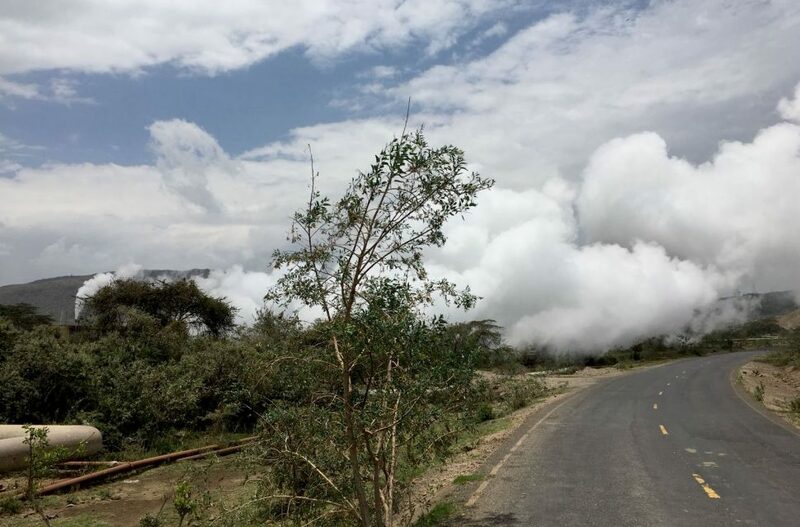 KenGen Kenya, the state-owned electric power generation company in Kenya, produces about 75 percent of electricity capacity installed in the country. The company utilizes various sources to generate electricity ranging from hydro, geothermal, thermal and wind. Currently, they are looking for opportunities to start large-scale solar energy production. In addition to large-scale energy power plants, it is important to find ways to finance the small-scale energy investments. For people in the rural area, getting electricity basically changes everything. It gives light to study, it enables charging a phone and to get access to the internet. However, the investment into anything is impossible to make if you are living from hand to mouth. A fin-tech startup TRINE provides investments to off-grid solar solutions from private investors. TRINE finances off-grid solar energy companies through crowd investments. It means that private individuals can make a sustainable investment of €25 or more, while off-grid solar energy companies get access to much-needed finance in order to provide clean energy to people in rural Africa. Since their launch two years ago, the company has provided more than 300.000 people the electricity with more than 4 million euro investments. To enable carbon leapfrogging, Kenya needs a policy that supports it. As seen in the Western countries, it is difficult to change direction once there have been huge investments made to fossil fuels. That’s why a policy that supports innovative green technologies is crucial. By turning the long time limitations into opportunities, Africa has now a unique opportunity to become a leader in distributed, carbon-free energy ecosystems and innovation. Nairobi Innovation Week is an event where entrepreneurs, large corporations and international organisations meet to showcase and encourage innovation. Demos Helsinki joined the event to facilitate discussion about the need and opportunities to drive low-carbon energy future in Kenya. We hosted a panel discussion with Antony Langat from KenGen, Hanna Lindquist from TRINE, Jussi Hinkkanen from Fuzu, Benjamin Kramer from Sanivation and Tim Cowman from Carbon Africa.